When we returned home from Christmas with the family, our voicemail and email were full of messages from our whitewater paddling buddies. 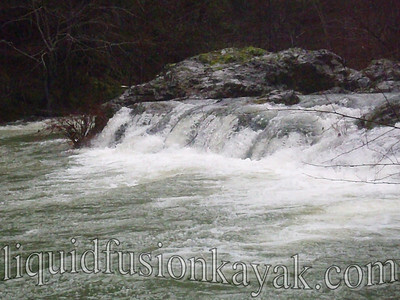 Rainfall Christmas day had all of our Mendocino County rivers flowing. Many were too flooded for fun whitewater but ahhhhh - our closest whitewater river run - Rancheria Creek was running at a playful level. Nick, Chuck, Jeff and myself set out for a rainy day of play on Rancheria Creek.It was starting to rain and the forecast was for several inches of rain (enough to flood the river and to close the road), but time was on our side. 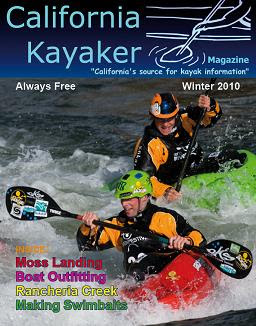 Last year, we ran Rancheria Creek numerous times for fun and then as research for an article for California Kayaker ( Winter 2010 Issue). 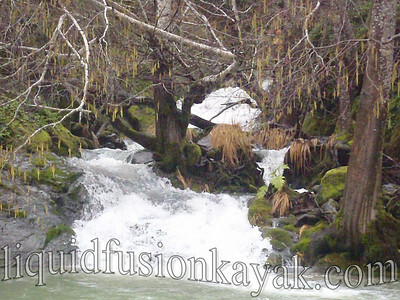 Approximately 500 cfs was a mellow flow with lots of fun eddies to catch and waves to surf. Steady rain kept the flow increasing. Glacial green water, mossy banks, wood ducks, herons, and dippers oooed and ahhhhed us as we played down the river. We saw 3 common mergansers and wondered if they were the same 3 that escorted us last year. Horse Creek is always a beautiful spot to admire. 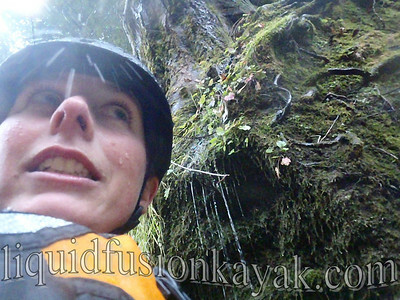 Today, Jeff and Chuck had other ideas for the waterfall drop. Nick and I of course were up for the entertainment and to be team photographers. First decent? 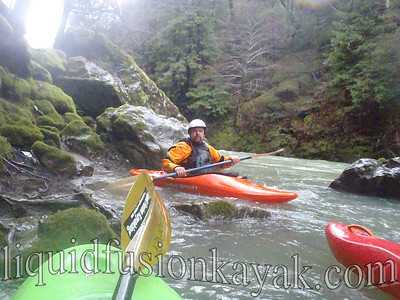 Nick says that he has run Rancheria hundreds of times with many boaters commenting on running the Horse Creek waterfall but no one to his knowledge has. As we paddled the rest of the river, I recalled our paddles from last year and tried to determine which was my favorite stretch. 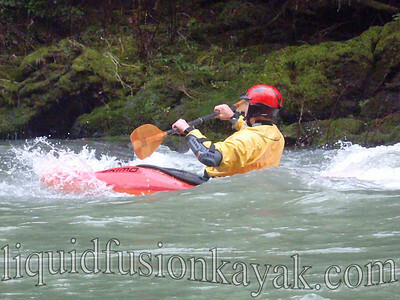 Running "The Ledge" and using it as a lunch/surf play spot is definitely a highlight as are some long class 2 rapids. However, I have decided that the aura of the creek - its mossy rocks, redwood lined gorges, and riparian/woodland wildlife are the highlight. I wish (like most others who have run Rancheria Creek) that there was an earlier take-out option. Rancheria Creek loses its whitewater character and scenic appeal after it is joined by Indian Creek and becomes the Navarro River. 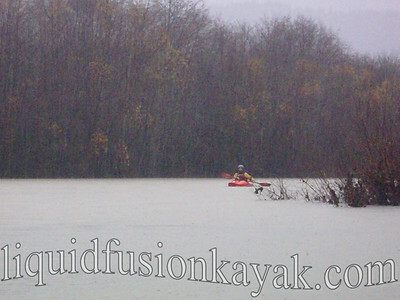 Today, we put a stick at the takeout at Hendy Woods to see how much the river rose while we paddled in the rain. It rose several inches during our paddle; however, over night it rose from 500 to 4,000 cfs which is a lot of water on a creek. We have been having fun creating photo slideshows with captions. 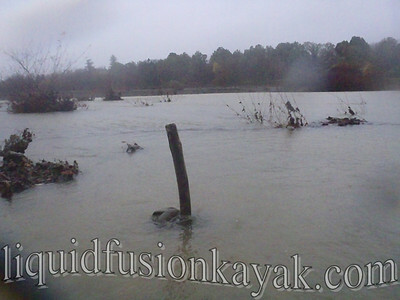 Here's a link to our December 2010 Rancheria Creek Slideshow.